Add the first 6 ingredients into your food processor. Blend until finely ground. Add the honey or agave (whichever you are using), vanilla and chia. Blend. Scrape down the sides. Then add the chocolate chips. Blend and scoop out into little balls. 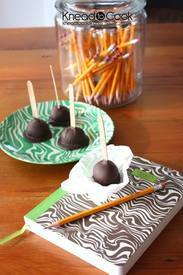 You can use little popsicle sticks or not, but dip the balls into the chocolate and cover completely. I placed on parchment paper and repeated. Place in the freezer for 15 minutes to set and then serve. Oh my goodness these are so good!